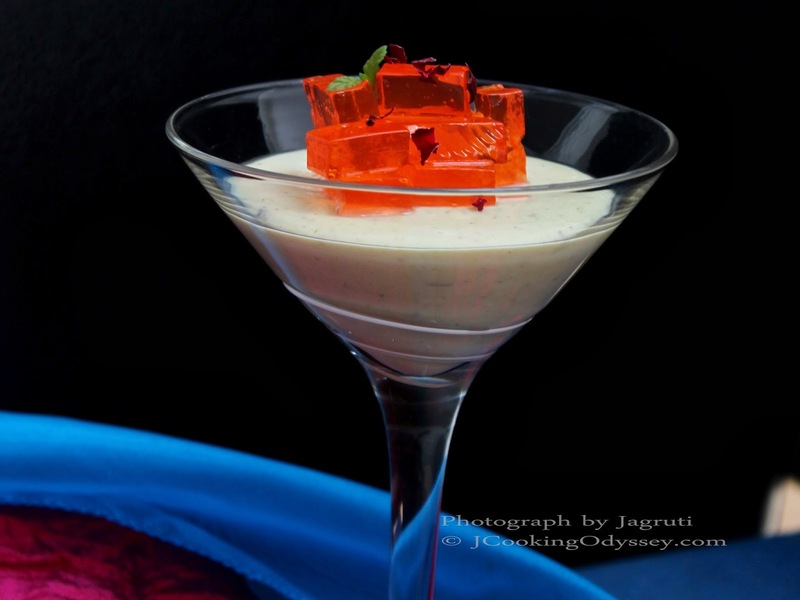 Jagruti's Cooking Odyssey: Thandai ( A refreshing spiced drink ) Panna cotta with Rose N Saffron Jelly - Holi Hai ! 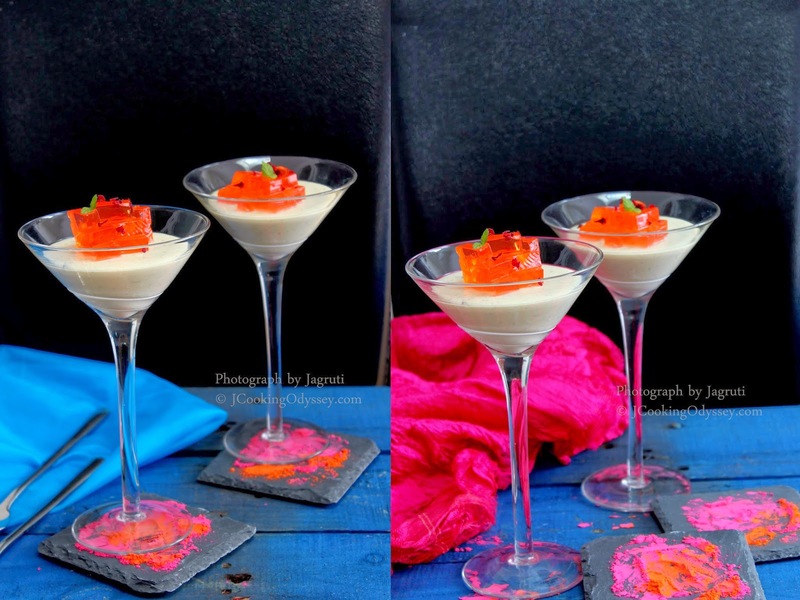 Thandai ( A refreshing spiced drink ) Panna cotta with Rose N Saffron Jelly - Holi Hai ! For Hindus, their social life is replete with celebrations, festive seasons allow them to come together as a community and celebrate their culture. A festival plays an important role in Hinduism as they enrich and refine life for those who celebrate. Most of the Hindu festivals are based on religious activities, like Diwali, Janmasthmi or Ganesh Chaturthi and many more. Within these festivals, most acts are religious but in other festivals such as makar sankrati and holi everyone can really let loose and just be merry! Holi is a time when man and nature alike throw off the gloom of winter and rejoice in the colors and liveliness of spring, Holi festival is all about embracing harmony. No matter what your wealth, Holi is a time where everyone can fully take part in the festivities. Although the festival of Holi holds a religious value, for most of us Holi is a carefree, fun, exciting and joyful festival than religious observance. Holi is a feast full of colours, dance and boisterous occasion. In another words, Holi is a celebration of Life ! JCO wishes one and all a joyful and safe Holi, May this festival of Holi bring into your life, vibrant colours of happiness today and always !! Festival of Holi is very well pictured and given a lot of importance in Bollywood movies and within Indian television. Few days back, my kids were watching tv and a holi song came on. In there, the characters were drinking thandai (bhang - an intoxicating drink) and behaving wild. 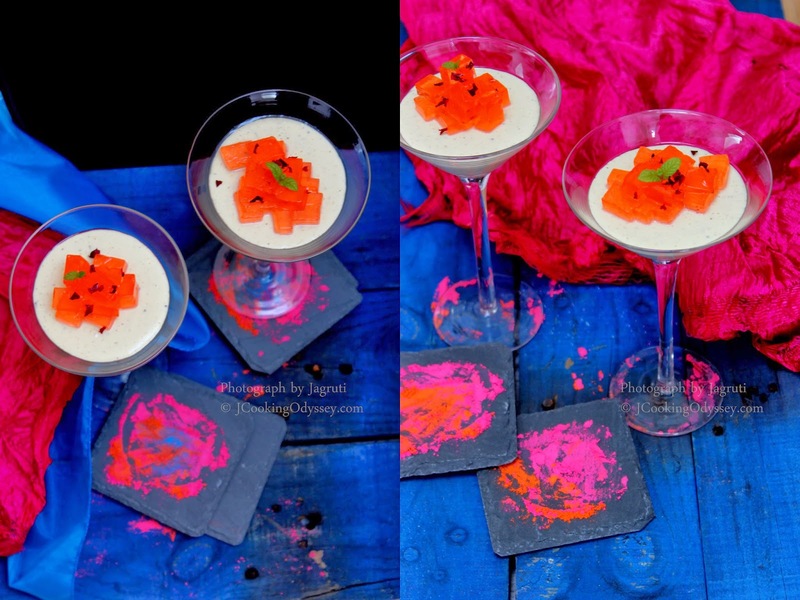 Both kids have never experienced the Holi festivities so they were curious about this drink! Forget the kids even I have never had this drink before!! 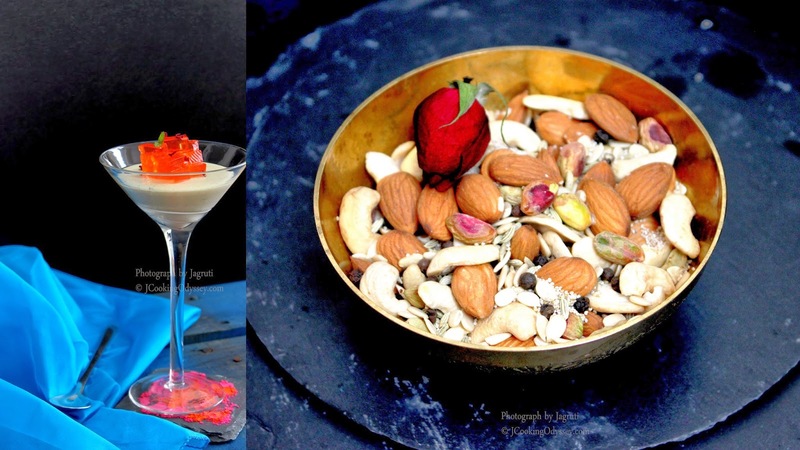 Thandai ( Thanda translates Cool ) is a refreshing and aromatic cold drink made with various nuts, seeds and spices and is drunk during the time of Holi especially. To give my kids a taste of this drink, I decided to make it at home and then adapt the recipe slightly by also making it as a panna cotta! Thandai can easily be made without the cannabis too! I also made jelly from agar agar and flavoured it with beautiful rose and saffron making it a perfect dessert to finish off any meal. 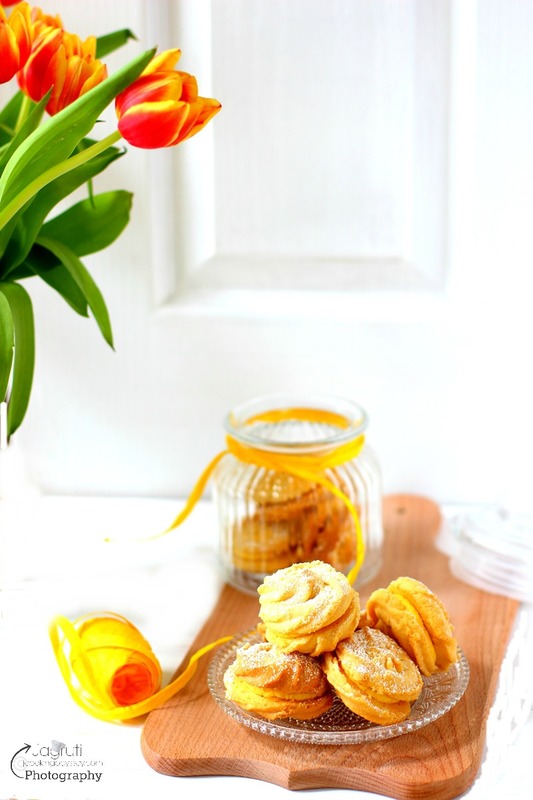 So enjoy this modern twist on the traditional Thandai recipe and Bring on the Spring!! 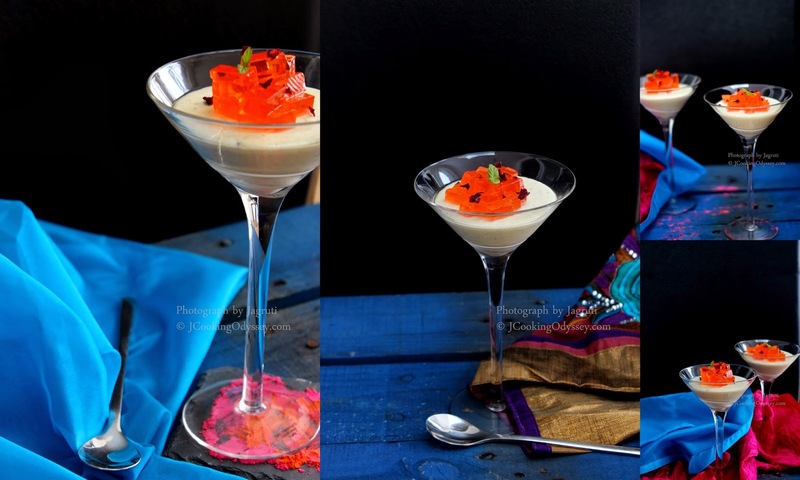 Heavenly delicious, awesomely rich, aromatic and gorgeously looking Thandai Panna cotta with Rose N Saffron Jelly ! Combine the agar agar powder sugar, saffron and water in a saucepan. Stir in rose syrup and rose extract . Pour in a mould or any flat tray, let it cool completely and leave it in the fridge to set. After one hour if set cut and use. Discard the water, and peel almond skin. Place everything in the grinder and add little water and grind till you get a very fine paste. Leave it aside for further use. Combine agar agar powder, sugar, milk and cream and stir till sugar melts completely. Reduce heat and add Thandai masala to it, cook another 2-3 minutes. Remove from the heat and let it cool for few minutes. Pour it in to serving glass ( I used martini glasses ) , cover with a cling film and let it set in the fridge for 2-3 hours. When you are ready to serve, garnish with rose and saffron jelly and mint leaves. 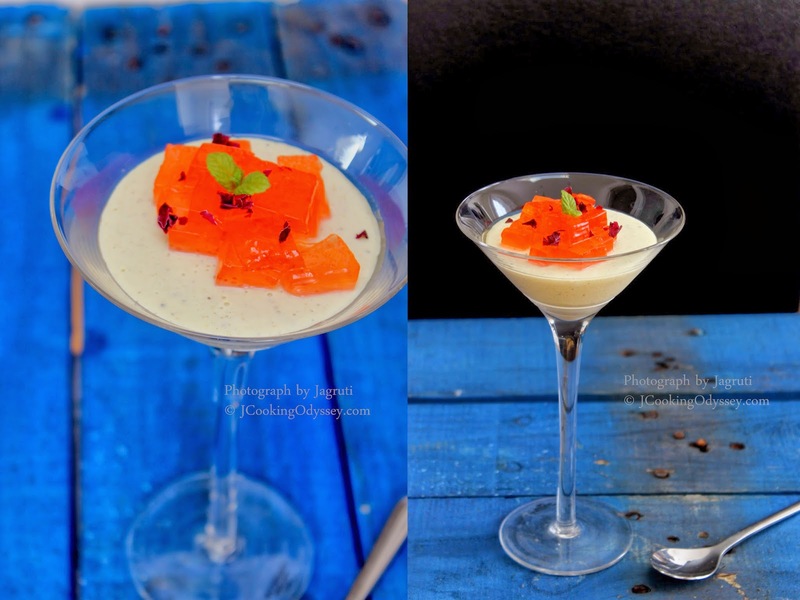 Enjoy chilled Thandai Pannacotta !! should go out and buy a lottery ticket today, looks so tempting. 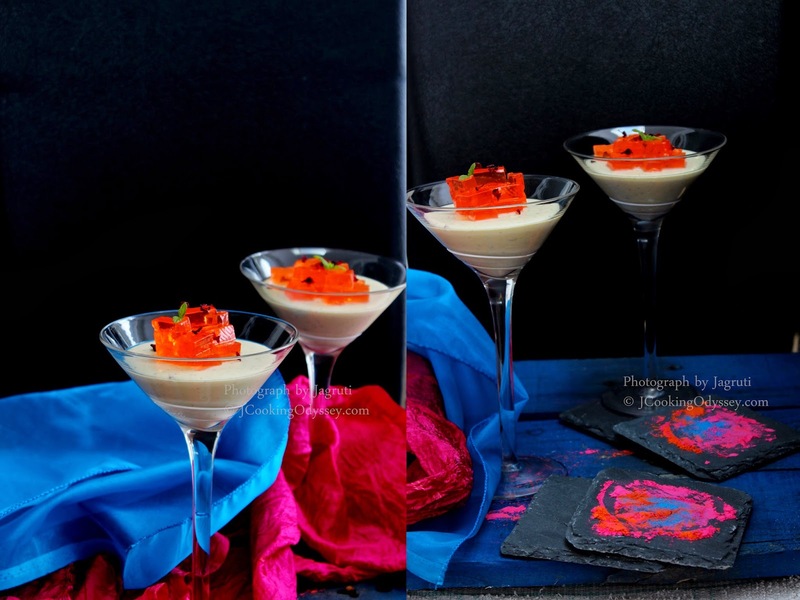 Thandai with twist looks yummy. Beautiful click. Very creative and innvovative..Beautiful clicks. Looks so yum.Nice clicks too.happy to follow you.